These cases are being discontinued but we do have some stock. 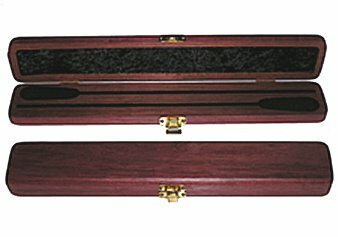 This handsome baton case fitted for a single baton by Premier will enable you to travel in style while protecting your prized Premier baton. (The image does show fitting for two but there are no doubles left) A Premier Baton up to 16" in length (not included) will fit. Available in Purpleheart or Walnut wood type. Please select wood type when you add to cart. Excellent for Presentation! Add a baton and engrave a brass plate to apply to lid of case. At your shopping cart you will see: "Engraving available" for an additional charge click on that to add. Then click on "Continue shopping" to add baton.